Mission: Building Climate Resilient Communities in the Upper Valley through Research, Information Sharing and Education. Climate Resiliency is the ability of a community to anticipate, prepare for, respond to and recover from climate impacts in a way that minimizes significant disruption to our lives and compromise of shared resources. This includes our health, safety, built environments, food availability, natural resources, wildlife and financial strength. 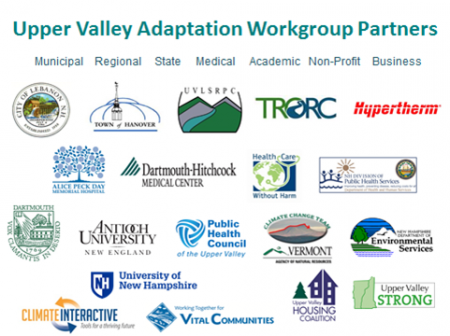 Upper Valley Adaptation Workgroup (UVAW) is a bi-state, multi-stakeholder working group of leaders and partner organizations. Started in December of 2011, the workgroup meets regularly focusing on the aim of building climate resilient communities in the Upper Valley Region of Vermont and New Hampshire. Please join us for a community conversation about mobilizing and building climate resilient communities in the Upper Valley. Municipalities, businesses, and opinion leaders are stronger together! This workshop is designed for all Upper Valley residents including community volunteer boards, municipal staff and committee members, health care professionals, community organizations, business owners and interested citizens. The workshop is free but the space is limited. Check out the Event Page for presentations! WHAT DOES , ADAPTATION LOOK LIKE? Please join us for a community conversation about climate change and building climate resilient communities in the Upper Valley. This workshop is designed for all Upper Valley residents including community volunteer boards, municipal staff and committee members, health care professionals, community organizations, business owners and interested citizens. The workshop is FREE, but space is limited. Click here for more information! UPPER VALLEY STRONG - "SERVE LOCAL"
The Public Health Network of the Upper Valley posted a blog about the UV Strong network and its work helping Upper Valley communities recover from natural disasters. Read all about it on the PHC web site. On April 5, 2016, NHDES posted an informative video on YouTube, "Climate Change - What does it mean for New Hampshire?" The video provides an easy to understand overview of how climate change is affecting the state. Take a look and share it with colleagues and friends. The Upper Valley Adaptation Workgroup and Public Health Council of the Upper Valley hosted a well-attended forum delving into how climate change trends have affected community health in the region and how projected changes will likely further influence how we learn to live in a changing climate. Matt Cahillane, NH Dept of Health and Human Services, and Jared Ulmer, VT Department of Health, reviewed statewide initiatives and Alice Ely, Public Health Council of the Upper Valley, presented the region's Climate+Health Initiative. Presentations from the forum are posted on the UVAW Events Page. UVAW partners developed a partnership with University of Vermont students in Adaptation to Climate Change in early 2015 to work with businesses in the Upper Valley to strengthen their resiliency to climate events. Students were introduced to their business partners on February 3, 2015 during the Building a Resilient Local Economy Workshop and the students will continued with site visits, interviews and consultations through the spring. recommend adaptation strategies that address vulnerabilities and increase business resiliency. UVAW ECONOMIC RESILIENCY WORKSHOP A SUCCESS!! The Upper Valley Adaptation Workgroup partners want to extend a big thank you to all those involved in the Economic Resiliency Workshop held on February 3, 2015. UVAW wants to extend a big thank you for the sponsorship and support of the National Association of Development Organizations, the US Economic Development Administration, Simbex, and Hypertherm. The UVM class for providing an extra hand at the workshop and for their ongoing work with area businesses and organizations developing resliency plans throughout the spring. Presentations and workshop materials available on the Events and Forums Page.